Since ancient times, music has been a tool to express emotions, hopes, and inspirations. Scientific studies for years have proven the effectiveness of music on an individual�s physical, mental, and emotional state to such a degree that hospitals and other healthcare facilities have integrated music therapy into their daily treatment regimens. But the incessant noise of modern life tends to muffle these beneficial harmonies. Celebrated author and musician Don Campbell pulls us out of the negative drone and helps us learn how to find the nutrition in sound for body, heart, and mind. 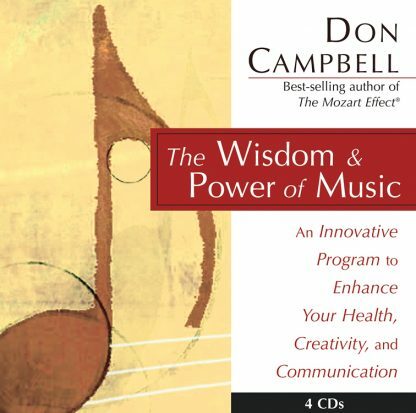 Campbell offers health, concentration, and creativity in his latest spoken word release, The Wisdom and Power of Music, a 4-CD set dedicated to improving listening, learning, and well-being. In this revolutionary program, you will learn how to use a variety of musical styles to help: Sharpen your concentration; Spark your creativity; Relieve stress; Deepen your listening skills; Explore the many uses of music with practical exercises; Tap the powers of meditation and inspiration. Whether you are a trained musician or just an avid music lover, this program will help you discover new benefits from listening.